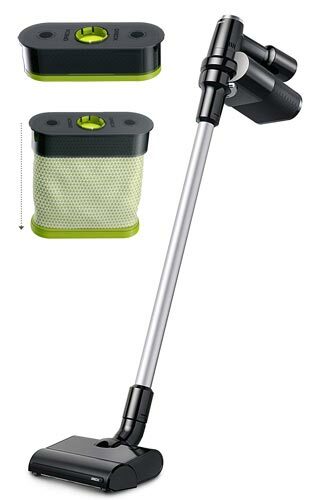 Oreck POD Cordless Bagged Stick Vacuum. Oreck’s new cordless stick vacuum with POD technology is the first bagged cordless vacuum that we have seen. The POD technology transforms into a bag, once installed. The POD will hold a lot more dust, dirt, and pet hair than cordless dust bins, and according to Oreck, will typically last 1 to 3 months of cleaning before full. When the POD bag is full, a red light will illuminate on the vacuum to let you know its time to change to a new POD. As the only bagged cordless, you will not have to deal with the plume of dust and allergens that all other cordless vacuums emit, when emptying into a trashcan. The cordless vacuum dust bin also can get dirt and dust stuck in the canister which you must clean out. Not so, with Oreck’s pod technology, as everything is sealed. Just pop out the pod bag into the trashcan, and put a new one in. The vacuum has strong suction, a multi-floor brushroll, and 2 speeds. Oreck also has a self sealing filtration system to contain up to 99% of particles. Additional Tools: AirPower pivoting brushroll tool, Wide-Path crevice tool, Soft-Bristle dust brush tool, Wall mount charging station. Smart-Review Commentary: The latest addition to the Oreck lineup is their POD cordless bagged vacuum. It is unique among all cordless stick vacuums, in that all the dust, dirt and allergens are sealed into the POD technology bags. With cordless bagless models, you will get a plume of dust and allergens when emptying the dirt bin into the trashcan. And you also have to clean out the dust and dirt that many times gets stuck in the dust bin. The POD frees you from this. Just detach the sealed POD bag, and throw it out. To keep your air clean, a self-sealing filtration system will contain up to 99% of particles as small as .5 microns, including allergens, pet hair, pollen and dust. When the POD is full, an indicator light will illuminate on the vacuum. The brushroll is multi-floor, and the suction is strong. The Oreck POD cordless will also detach to a handheld to clean stairs, upholstery, and car interiors. The Oreck POD has a 3 year warranty and is made in the USA. The POD technology will keep things sanitary, and eliminate your need to deal with dust and dirt when emptying. This model has received excellent consumer reviews and is a Smart-Review top pick in the bagged cordless vacuum category.